Most urban centers have a bad rap for pollution and energy consumption, but the cities of the future could be very different. 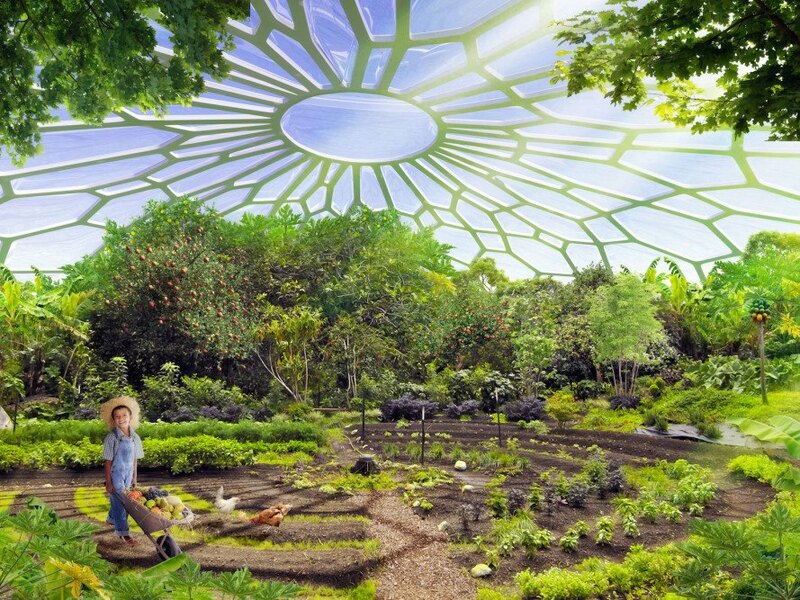 Vincent Callebaut unveiled designs for a self-sustaining urban utopia that not only grows organic food, but also produces more energy than it consumes in a closed-loop system. 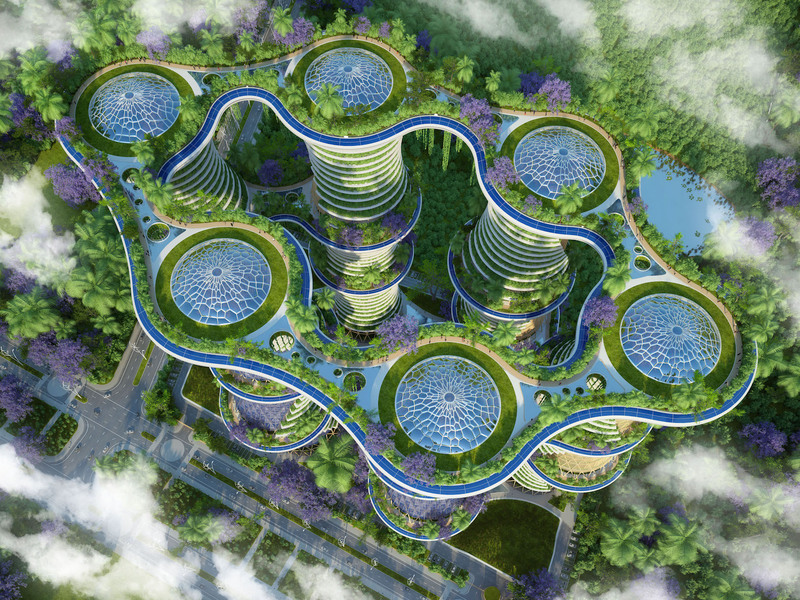 Proposed for India’s new Jaypee city, the urban farming eco-neighborhood, called Hyperions, inserts lush “agritectural” garden towers into a neighborhood notoriously choked by concrete and pollution. Designed in collaboration with agroecologist Amlankusum, Hyperions was created to achieve two major objectives: energy decentralization and food deindustrialization. The result combines urban agriculture, bio-based materials, and dense mixed-use planning into a self-sufficient development. The project comprises six 36-story connected towers built from cross-laminated timber sourced locally and sustainably from a Delhi forest. Reinforced with steel, the timber towers sit atop a steel and concrete substructure engineered for earthquake resistance and to take advantage of the earth’s thermal inertia for stable natural heating and cooling. The project is designed to achieve a net-zero environmental footprint with a recycling system that takes care of gray water, black water, and food waste on site. Energy for the buildings is generated via wind turbines and photovoltaic systems. Topped with a glass bioclimatic domed greenhouse and clad in solar panels, each tower houses a mix of programming, from business incubators and coworking spaces to student housing and larger apartments. The living areas are integrated with the farming spaces, which the architects say can produce 20 kilos of organic fruit and vegetables per square meter (4 pounds per square foot) that would be sold through local fair trade shops. Organic aquaponic and traditional farming techniques would be used, with the latter emphasizing healthy soils through incorporation of compost, diversified crops, and minimal tillage. Many of the crops will be self-reproducing and endemic. The towers will also have room for raising livestock as well as phyto-purification ponds and lagoons. Rainwater will be collected for irrigation and to replenish groundwater. "Topped with a glass bioclimatic domed greenhouse and clad in solar panels..." For me the roof brings to mind the iconic roof of the New York State Pavilion at the 1964 World's Fair. But instead of a terrazzo tiled floor indicating the location of Standard Oil gas stations around New York State, a revamped NYS Pavilion would herald a possible future of urban agriculture. A major cost of such a renovation to restore the beloved Queens, NY landmark would be to stabilize the 98-foot concrete pillars. Absolute rubbish. For starters such a building will cost several fortunes. Also as human waste is prohibited for organic growing. From where will the inputs come. Net zero? Nope. Designed in collaboration with agroecologist Amlankusum, Hyperions was created to achieve two major objectives: energy decentralization and food deindustrialization. The result combines urban agriculture, bio-based materials, and dense mixed-use planning into a self-sufficient development. The project comprises six 36-story connected towers built from cross-laminated timber sourced locally and sustainably from a Delhi forest. Reinforced with steel, the timber towers sit atop a steel and concrete substructure engineered for earthquake resistance and to take advantage of the earth’s thermal inertia for stable natural heating and cooling. The project is designed to achieve a net-zero environmental footprint with a recycling system that takes care of gray water, black water, and food waste on site. 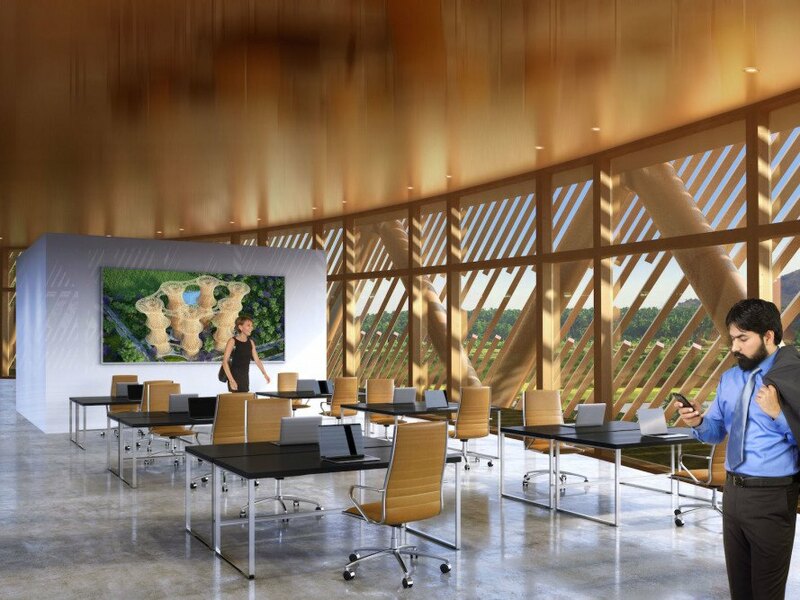 Energy for the buildings is generated via wind turbines and photovoltaic systems. Topped with a glass bioclimatic domed greenhouse and clad in solar panels, each tower houses a mix of programming, from business incubators and coworking spaces to student housing and larger apartments. The living areas are integrated with the farming spaces, which the architects say can produce 20 kilos of organic fruit and vegetables per square meter (4 pounds per square foot) that would be sold through local fair trade shops. Organic aquaponic and traditional farming techniques would be used, with the latter emphasizing healthy soils through incorporation of compost, diversified crops, and minimal tillage. Many of the crops will be self-reproducing and endemic. The towers will also have room for raising livestock as well as phyto-purification ponds and lagoons. Rainwater will be collected for irrigation and to replenish groundwater.